Meatballs are a staple in many different cultures and have been served up across the globe since Roman times. In Russia, Tefteli are popular as comfort food and are typically served with boiled or fried potatoes rather than with pasta as has become more common in North America. While most traditional Russian recipes suggest making very large meatballs, I like to make mine much smaller so they are easier to serve and eat. Rather than simmering the meatballs in a vat of sauce, serving them individually on tiny plates or Asian soup spoons makes for a much prettier presentation. You can vary the meat and seasonings in this dish to suit your preferences but don’t skip the cream sauce – it’s delicious – even on storebought meatballs (that can be our little secret)! Don’t be intimidated by the length of this recipe – all the components can be prepared ahead of time and reheated at serving time. 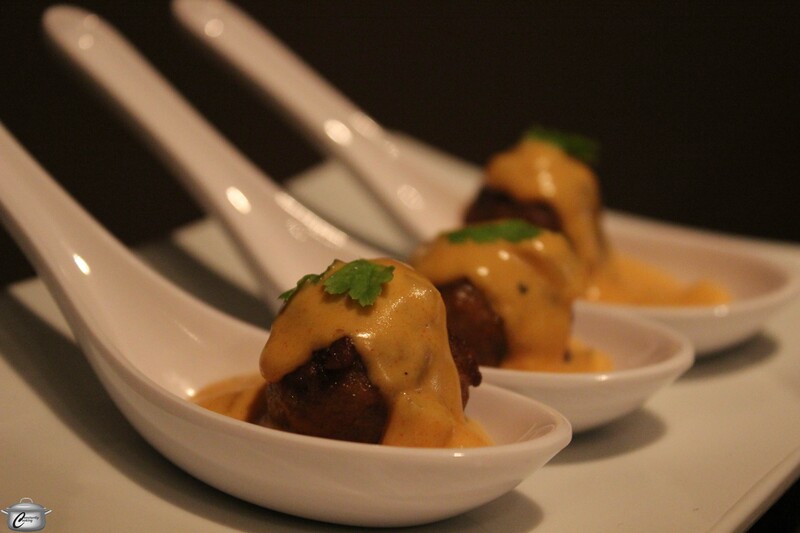 Meatballs topped with a flavourful cream sauce make for an attractive and delicious Russian-inspired appetizer. Heat the olive oil in a small saucepan over medium heat. Add the onion and carrots; sauté until they are softened (about 3 minutes). Sprinkle flour over top and stir to blend. Cook for one minute, stirring constantly. Add chicken stock, a bit at a time, and stir to eliminate any lumps. Cook for 2 minutes, stirring often. Add paprika, mustard, turmeric, vinegar and tomato paste. Stir well to combine and cook for 1 minute longer. Add sour cream and heavy cream. Heat until just about to boil then reduce heat to low. Cover and keep warm, stirring occasionally, while you prepare the meatballs. The sauce may be made ahead and refrigerated or frozen then reheated gently just before serving time. Tear apart slice of bread and put into a small bowl. Pour milk over top, using just enough to dampen bread well. Let sit while you prepare the rest of the ingredients. Put ground meats, rice, garlic, onion, yogurt, egg and seasonings in a large bowl. Drain the excess milk from the bread and add the bread to the meat mixture, discarding milk. Using your hands (grease them with a little olive oil first) or a small cookie scoop, shape the meat mixture into one inch (2.5 cm) balls. Roll the balls in the Panko. When all the meatballs have been shaped and rolled, they are ready to be cooked. Heat the oil in a large non-stick skillet over medium heat. When it’s hot, cook the meatballs in small batches (if you crowd them in the pan they will be difficult to turn), sautéing them about 3 minutes per side until evenly browned. When all the meatballs have been browned, you can return the first batch(es) to the pan, reduce heat to low and cover to keep warm as you prepare serving dishes and reheat the sauce, if necessary. Note that meatballs can be made and cooked ahead of time, then refrigerated or frozen until needed. Reheat on a baking tray in the oven at 350F until hot. To serve, put a small amount of warm sauce in the bottom of a small plate, bowl, or Asian soup spoon. Place one meatball on top of the sauce and drizzle a generous teaspoonful of sauce on top of the meatball. Repeat with additional plates. Alternatively, you can put the meatballs and sauce in a chafing dish or fondue pot and people can serve themselves. Makes approximately 30 small meatballs. This entry was posted in Appetizers, Meat, poultry, fish and tagged appetizer, carrot, chicken stock, cream, cream sauce, garlic, ground meat, meatballs, Olympics, onion, party food, rice, Russian, sour cream, tefteli, tomato paste, turmeric, yogurt. Bookmark the permalink.